RUSH: 46 to 53, and it is over. We have some audio sound bites from the debate that happened on the floor of the Senate this morning. It’s truly astounding, and I want to you hear these sound bites. Here’s what’s going to happen next. Just a little prediction here, and I told you, we went out on a limb yesterday and predicted to you this thing would go down in flames. There were 18, as I counted, 18 switch votes, and, by the way, I want to tell you one thing, everybody is going to try to portray this as a loss for the president, which it is. And everybody is going to try to portray this as talk radio running amuck, ‘We gotta do something about it.’ In fact, I know for a fact that Democrats were telling Republicans in the Senate yesterday, ‘Well, just go ahead and vote for this thing, by the time you’re up for reelection, we’ll have dealt with talk radio.’ There were Democrats telling Republicans that they shouldn’t worry about it because we’re going to deal with talk radio. Now they’re really going to deal with talk radio. This Fairness Doctrine stuff is going to really heat up. What’s going to make it different this time, I think, at least on the side in the Senate is that Republicans are going to join Democrats in all this. But don’t worry, folks, we are geared up for this and ready for it. In addition to all that, I think what’s going to happen is there will be propaganda now from the open borders Republicans like Lindsey Grahamnesty. I say this because some of the things that he said on the floor of the Senate today, not just Grahamnesty, but a bunch of others are going to say that you and I are now going to be responsible for Hispanics voting for Democrats because we opposed this bill. You’re going to be tarred and feathered as a vocal and loud minority and racists and all that, but they can’t say you don’t count. When the rubber hit the road, that’s why one of the reasons I was fairly confident about this and not panicking yesterday, one of the reasons, when the rubber hit the road, they listened to you. They listened to the polling on this. You shut down Washington’s whole phone system today. Passport offices, everything was shut down. In the Senate I think they shut down the phone system, Jeff Sessions said something like that, just to avoid having the whole thing get shut down. They had to limit access to it because you were being heard. American people in this country, on balance, not in every instance, but they get what they want. In this case, this bill is dead for two years now because Dingy Harry says he can’t bring this up next year, it’s the presidential election. Well, fine and dandy. This debate needs to be part of the presidential race, folks. Make it a national debate and have it out in the open, not behind closed doors with amendments that nobody read, amendments that did not have a chance. By the way, all this talk about the Fairness Doctrine and there’s too much one-sided opinion on talk radio, how about the Fairness Doctrine applied to the Senate. Dingy Harry literally shut down debate on this at a point yesterday. I have some comments from senators on that in the audio sound bite roster as well. We are in our current situation with this whole immigration imbroglio because people like senator Lindsey Grahamnesty and others who have served in Congress for many years and who have sworn to uphold the law have failed to uphold the law. Let’s be clear about this. Grahamnesty and his fellow amnesty supporters have used rhetoric and arguments that have undoubtedly inflamed various ethnic groups, not us. We have to go on the offense about this, rather than being defensive, because you and I, all of us that ganged up on Washington, we are going to be accused here of all kinds of racism and hate and bigotry. And we have been. It’s going to continue. It will probably expand and increase. If there are riots, if the illegals come out of the shadow and riot, and there’s talk that they might — oh, well, it would be funny if they did. We can’t find them, but they’ll come to us. But there’s talk, you know, people trying to stir the excrement out there, if you will. They’re going to say, if that happens, talk radio did it. ‘This is what happens when you have lack of balance in the media,’ so forth and so on. You will all be included in this rhetoric, but the rhetoric that has been used by the open borders crowd has inflamed a lot of ethnic groups. 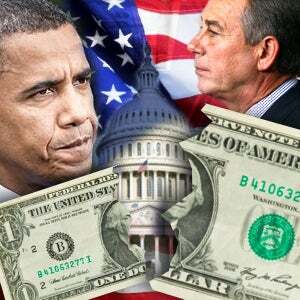 By the way, do you realize the Democrats run the Senate and Harry Reid couldn’t get this bill through? Now, you can sit there and blame talk radio all you want and you can sit there and blame the American people and racism and hatred and bigotry and all that. Democrats could not get this done, and he couldn’t get enough of his own senators to vote for this. The primary group of senators he couldn’t corral were the freshman Democrat senators who were very, very much concerned about this. He lost Mary Landrieu. Why do you think Landrieu was opposed to this? She’s up for reelection, and she’s also concerned about what the unchecked invasion of illegal immigrants might do to Louisiana, might do to New Orleans and so forth and the culture that she was born and raised in. This whole thing that this is a racist idea and issue is absurd in the first place. Border security is what this was all about. Border securing and complying with the law is what this was all about. That shouldn’t be a pro or con Hispanic issue. Yet that’s how Lindsey Grahamnesty and a bunch of other proponents on this, these open border supporters, have defined the issue. And, of course, the Drive-By Media happily repeats it. Now, if we lose seats in ’08 and if we lose Hispanic votes, I’m not going to take the blame here, folks, and you shouldn’t take the blame, either. If we lose seats, these guys are responsible for their elections. They’re the ones that go out and get the votes. If people vote against them because of this, they will have their own actions to blame. I’ve been talking about Lindsey Grahamnesty. Let me explain why. Go to audio sound bites one and two here, just to give you an idea from the Senate floor today. Here is Senator Grahamnesty. GRAHAM: You’re never going to deal with this issue until you embrace the 12 million. No Democrat is going to let you build a fence and do all the things that we want to do without addressing the 12 million. That’s never going to happen. I want to address the 12 million. The reason I want to address the 12 million, it bothers me that there’s 12 million people here that we don’t know who they are and what they’re up to. I wish they would go away, but they’re not. It is a problem that America has to deal with, and we want someone else to do it, because we’re afraid that if we do a plea bargain, it’s amnesty. RUSH: What in the world — did you hear this? ‘The reason I want to address the 12 million, it bothers me there’s 12 million people here that we don’t know who they are and what they’re up to.’ I thought they were doing the jobs the American people won’t do! All of a sudden we’re getting a new characterization of who these people are. They’re a bunch of renegades and ragtags running around. We don’t know who they are or what they’re doing? But he basically said, ‘You people that want border security first had better check it at the door because it ain’t going to happen. We gonna deal with these 12 million.’ He said the Democrats aren’t going to let this happen. So we find out that he’s been kowtowing to the Democrats. He said the Democrats are never going to let you build the fence and do all the things that we want to do without addressing the 12 million, and he said our job’s to go there and work with Democrats. No, it’s not. Go there and debate them and defeat them. I’m going to just assert this. We did the job that Lindsey Grahamnesty should have been doing, as an elected Republican, and a number of other Republicans. We, you and I, did the job they should have been doing. Here’s the second sound bite from Senator Grahamnesty. GRAHAM: The 12 million will be dealt with. They’re not going to be ignored. They will be dealt with firmly and fairly, eventually. They’re not going to be deported, they’re not going to jail, they can’t be wished away. So we need to come together in a bipartisan manner, have principled compromise, where we deal with 12 million, we deal with broken borders, we get a temporary worker program. To my Republican friends, remember this day if you vote no. You will never, ever have this deal again. RUSH: That’s right. Because we’re going to get a better deal next time. We’ll never, ever have this deal again. We’re gonna get a better deal. We didn’t want this deal. This was a bad deal. It was the wrong deal to make. It was the Comprehensive Destruction of the Republican Party Act of 2007. Here’s Dingy Harry Reid’s response on the floor of the Senate after the cloture vote failed. RUSH: Stop the tape. I want to translate this for you. What it means is, we bought off a bunch of Republicans and made ’em see the world our way. And that’s called trust. When Republicans cave to their own principles; when Republicans give in and have as their main objective getting along with people like Harry Reid, ‘Harry, this is great. We’ve made new alliances. We’ve come up with new friendships. We’ve formed new bonds of trust here.’ And all that means is we suckered a bunch of these Republicans into going along with us. Here’s the rest of this bite. RUSH: Stop the tape a minute. You can work as closely together as you want, but when you’re wrong, you’re going to hear about it. When you do something that’s so tone deaf; when you’re so out of step with the citizens of this country who have elected you, you’re going to hear about it. Whatever the new legislation, I don’t care if you’re talking about taxes, because what people have learned here, Senator Reid, is that you can be stopped. What people have learned here is that they do have power, that their vote does matter, that what polls say reflecting their opinions does matter. People all over this country for years have thought they shouldn’t get involved because their vote, their action, their involvement, was irrelevant. They learned today just the exact opposite. They learned it during the Dubai Ports deal. I still love saying those three words. They also, Senator Reid, have learned something else. They have seen the arrogance and conceit of a bloated, inefficient, big government. That is the thing that ought to cause some Democrats to quake in their boots more than anything. The idea of how big government works, how arrogant and condescending it can be, and even insulting, has been on full display. So those are the opportunities I see. The opportunities Dingy Harry sees to go on and convince more Republicans to cave and give in and join with Democrats and to him, that’s a plus thing, but if they’re wrong in what they’re trying to do, they will hear about it. Now, why is it that the things that Senator Kennedy says during this debate don’t do that? Why is it that some of the debate that the senators engage in doesn’t cause people to get emotional? Well, we know it does. How come that we’re not entitled to get emotional when we’re lied to, when we’re told that we’re racists, we’re told that we’re bigots, and when we’re told that we don’t know what’s in the bill. This $4.4 billion emergency spending procedure, the supplemental spending bill that was going to build the fence, get started border security, Jim DeMint, a Senator from South Carolina said, (paraphrasing) ‘Guess what? There’s a provision in this thing that allows that money to be used for the amnesty purposes of the legislation, and it’s so designed.’ So they didn’t even tell us the truth about that. There was a caveat in the $4.4 billion. We spend that much on rubber bands in this government every year. $4.4 billion for fence security and so forth. Yeah, it’s only the rhetoric here on talk radio. By the way, the underlying notion here is that you people are continuing to be mind-numbed robots. There’s still no respect for the fact that you are informed, engaged, involved citizens who vote. You’re just sponges without minds of your own, and you are filled with, what did he say, racism and bigotry, and it pushes you over the edge emotionally. Let’s see. This is not a quote from anybody. This is just the New York Times reporter Jeff Zeleny. ‘At the heart of the opposition rests conservative hosts on talk radio and cable television, which often are a muscular if untamed piece of the Republican message machine.’ How in the name of Sam Hill do you come to that conclusion? Because all these years what I have heard is that I’m in the back pocket of the GOP. I’m just sitting here getting their faxes. I’m getting their e-mails from the White House, and I get my marching orders from them and then I go out and say what I say, then it ends up on Drudge. It ends up on all other talk shows. It ends up on the Internet, and I’m just my own mind-numbed robot, whatever the White House says, do it. Now all of a sudden I am an untamed piece of the Republican message machine. After all of this, how I can be called a piece of the Republican message machine… But this is the template, and this is the bias of the Drive-By Media, that there is no independence here like there is in the Drive-By Media. There’s no independent thought, there’s no individuality whatsoever. We’re all just mind-numbed robots on the right, folks. We’re kooks because we are conservatives. Unnamed piece of the Republican message machine. ‘Several senators said Wednesday that they did not care to be identified speaking critically of the broadcasters, fearing the same conservative backlash that befell Senator Trent Lott, a Mississippi Republican, this month when he declared: ‘Talk radio is running America. We have to deal with that problem.” So a lot of Republican senators apparently wanted to launch but were afraid of the backlash caused by us unnamed pieces of the Republican message machine. Dingy Harry, we have time to squeeze this in. This morning on the Senate floor before the vote. REID: Talk radio has had a field day. These generators of simplicity — now, Mr. President, I want everyone to know and I want the record spread, I do not believe that anyone who is a United States senator that votes against this motion to proceed is filled with prejudice, with hatred, with venom as we get in our phone calls and our mail. I don’t believe that. But I do believe, Mr. President, that we have an issue before us that we must resolve. RUSH: Okay, so now a untamed member of the piece of the Republican message machine, but now we are generators of simplicity here on talk radio, and here we’re back to again these assertions that those of you who have been calling Dingy Harry and his colleagues are racists, full of hate, and venom. If there’s any venom being directed at you, Senator Reid and colleagues, it’s simply because you haven’t been listening and you haven’t been telling us the truth. You’ve been insulting us. RUSH: I’m throwing up here. I am literally going to throw up. PELOSI: — where it’s dark, light, and to forgive is to be forgiven — and all a sudden all these people of faith are just very unforgiving. RUSH: How can you speak that way, after some of the hate-filled rhetoric that you and the people you empower have offered up against President Bush? After all the things that you have said to demoralize the troops serving this countries, risking their lives, all of the investment in defeat that you and Senator Reid have made it plain your party is for, you dare sit there and talk about hate speech and unforgiving speech, hate radio and so forth? I think these people owe us an apology. I think Senator Graham in South Carolina owes all of you in South Carolina an apology for his rhetoric and his comments about you. This whole debate has featured elected officials insulting their constituents one way or another. We either haven’t read the bill when we have, or we haven’t got minds of our own, or we’re racists or bigots — and now there’s hate. I’m going to tell you something. The hate on balance in this country resides on the left side of the aisle. What is going on with Senator Leahy trying to subpoena and harass the Bush administration? This is nothing more than harassment. You might say it’s politics, but you can’t convince me these people don’t viscerally hate George W. Bush, and they have hated George W. Bush since the Florida aftermath. I wonder if Nancy Pelosi asked the people calling her office, as she’s talking about this, if they were people of faith, or is that just more religious profiling? Is she just saying that the people who called her were a bunch of southern hayseed conservative Christian hicks? Remember, the people that work on bias and prejudice in this country are the people on the left. They’re the ones that form opinions of people based on where they live, based on their accents, based on their skin color, based on their gender, based on their sexual orientation, and based on whether or not they can fit into a nice little liberal created victim group. Anyway, I told you at the beginning of the show. This is only gonna heat up, and it is going to manifest itself in more calls for ‘fairness.’ One element of the media should not be so out of balance as is talk radio. Keep a sharp eye. 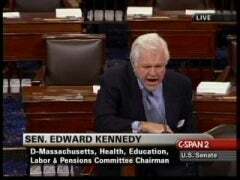 Want to hear some funny stuff from Ted Kennedy, yelling today during the immigration debate? He said this about those who oppose the immigration bill. This is before the vote. RUSH: Well, this is laughable. Senator Kennedy, perhaps you don’t remember that there was an amendment offered, the touchback amendment, and this is where all of these 12 million (as you say, we think it’s closer to 20) but have to go back to their home countries. Now, just how in the world were they going to be found and forced to do this? If we can’t find ’em now, if it’s going to cost too much money and all this, how in the world…? Oh, oh, oh, I get it! They were going to obey the law on their own. Oh, they knew that. You think that was going to happen? They wouldn’t trust that provision for a second, and they know there’s no reason to leave, because the odds that they’re going to be rounded up are no better than they’ve ever been, so why? Why go back and touchback when the overriding theory you have is you might not get back in unless you come in illegally. There’s so many contradictions in all of this, but we have shouted from the rooftops — I’m sorry, from the golden microphone, Senator Kennedy — a we do know what we’re for, and that’s enforcement of current law. Enforce of existing law! It’s not complicated. Here’s more of Senator Kennedy. KENNEDY: And we have a process, er, that said, ‘Look, okay, you’re here and undocumented, and you’re going to have to pay a price. We’re going to take people that are in the line, that have said that they want to play by the rules. They go and they wait and you wait and you wait and you wait and you wait, and you pay and you pay and you pay. You pay, uh, your fees. You pay your processing fees, your adjustment fees. You pay, uh, not only for yourself; you pay for the other members of the family. You demonstrate that you’re going to learn English. You demonstrate that you’ve worked here. You demonstrate that you’re a good citizen. You demonstrate that you haven’t had any run on in on crime [sic], and then maybe — and then maybe — you get on that pathway with the green card and perhaps in 15, 18 years you’ll be able to raise your hand and be a citizen, eh, here in the United States. RUSH: (Laughing.) Fifteen to 18 years to be a citizen! (Laughing.) You know, this is why it’s laughable when they insult us for not knowing what’s in the bill. The simple fact of the matter is that there’s no need for these people to pursue the path to citizenship because the minute this bill would have been signed, they’re legal! You all know all this. We’re going blue in the face talking about it. If this bill ever does or did become law, the minute it’s signed, they’re legal — after the mythical 24-hour background check. (Laughing.) How are we gonna do the background check if we can’t find ’em? But they don’t have to pay the fines if they don’t pursue citizenship. This really is a disconnect here. I don’t know if it’s just tone deaf. I think they have, Senator Kennedy and some of these people, such a lofty view of these people that he thinks that they all want to be full-fledged citizens (crying), and that that’s what they’re dying to do, and that’s what they came here for, and we’re standing in their way (sobbing), because these bigots and racists and restrictionists and talk radio! All we want them to do is be citizens in 15 to 18 years. But they don’t have to do any of that and that’s the only way they get out of paying the fine. We also know that if they did pursue citizenship, it wouldn’t be long before the senators would say, ‘Well, you know, this $5,000 fine? That’s bit high. It’s a bit punitive. Why, we’re taking food out of the mouths of starving children who are someday going to be American citizens.’ All of this was poppycock. What it boils down to is, very simply, the American people — you –didn’t believe what your elected officials were telling you, and you didn’t believe that they could do what they said the bill would do, and that’s why I said this is an opportunity. People got a great illustration here of the inefficiencies and the unworkableness of a bloated, over-the-top-size government, and believe me, folks, that’s premise I’m not going to abandon. It’s going to be a reminder I’m going to continue to make, because that’s something that people may not even notice themselves until it’s pointed out to them, until their reminded of it, but this was one of the fabulous aspects of all this that happened.